Schleck cobbles together a plan to win 2010 Tour de France. Sticks and stones may break Alberto's bones. Forgive me oh Lord, for I have succumbed to the use of a cheap pun headline. Nevertheless, that’s the plan Andy Schleck has in mind to beat two-time Tour de France winner Alberto Contador. He’s not going to beat him in the mountains or time trials, he’s going to whomp him on the cobblestones. Yes, Shleck’s going to stone Alberto to death. The Saxo bank rider and bald brain trust Bjarne Riis have identified stage 3 as the tipping point, the Spanish rider’s soft underbelly. 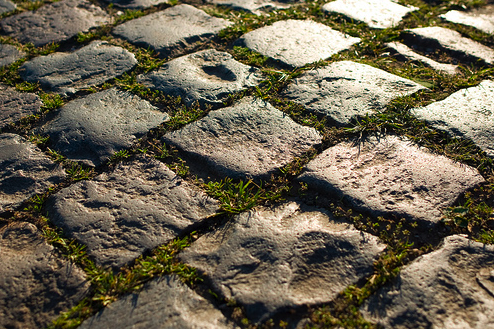 The 207-kilometre stage from Wanze to Arenberg has seven sectors of pavé, 13.2 kilometers of Roubaix-ish cobblestones. And while Contador will have the invaluable help and experience of nobody you can name, Shleck with have Fabian Cancellara and Stuart O’Grady, two Paris-Roubaix winners, at his side. Schleck told Le Quotidien, “his problem will be the pavé. He could suffer, while [brother] Fränk and I will be able to rely on specialists.” And he’s not talking about the orthodontist, fellow cyclists. Do not be surprised to discover later that Bjarne Riis has asked race officials to dig up a few sections of road and install more cobblestones. Prices on cobblestone have never been lower. Andy Schleck thinks he’s found a chink in Alberto’s armor. “He does show some weaknesses, like this year at Paris-Nice. So he is not unbeatable. To succeed, we must do everything at 100 per cent, ” said Schleck. The back-up plan is just to throw rocks at Contador when he crashes. « Astana’s ProTour license review drags on. Approval by insult?